Singing and Spinning: What did you have for dinner? Since we will be spending so much time on the boat, I thought I'd celebrate with a "dinner at sea." Jade, especially, LOVED it. She even thanked Heavenly Father in the prayer for her "awesome dinner" and thanked Him for the "most awesomest mom in the world." Maybe I should make creative dinners a little more often. 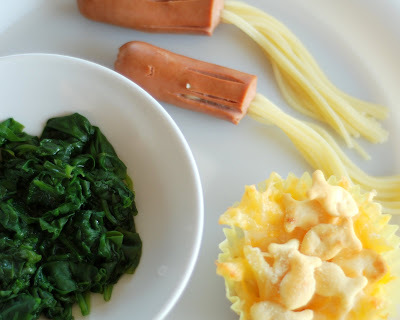 I made seaweed spinach, goldfish mac and cheese and hot dog squid. I've posted the mac and cheese recipe and the instructions for hot dog squid on the recipe blog. (I saw the hot dog idea on Family Fun- I think).